A Conversation with Theresa Argondezzi, Health Educator, Norwalk Health Department and Lisa Lenskold, Director of Norwalk Grows. The vision of Norwalk ACTS is to make our city the healthiest place in America to raise a child. The Norwalk Health Department has been extremely proactive and innovative with programs and resources to help the community focus on health and wellness, a critical component of success in school and in life. Q: How did it all begin? How did the Health Department become a community Bright Spot, leading the way in Health and Wellness? A: We drew on the Community Health Assessment and Community Health Improvement Plan to set our goals and objectives. In other words, we used data. We partnered with Norwalk Hospital and many other health-related organizations to conduct an updated assessment in 2016. We also looked at secondary data to identify health trends and determine the priority areas. Through this process, we know that chronic disease (diabetes, heart disease, and hypertension) frequently brought about by obesity, is still the number one health issue facing our community – both for adults and children. As a result, our policies and programmatic initiatives focus on prevention strategies. Q: What specific data did you use to help focus your priorities? A: In 2016, we were able to collect primary data by partnering with Data Haven to conduct a community wellness survey that included 600 Norwalk residents. There was also an Informant Survey which reached out to legislators and community leaders to find out their opinions on health issues. We also looked at data from the Census, the State Department of Public Health, and Norwalk Hospital Utilization data (reasons for hospitalization) however, this data focuses only on adults. So to round out the Health Assessment, we also conducted community forums with NAACP, a group of Brien McMahon High School students, and others to fill in the gaps and complete the picture. Q: This looks like a lot of data. Where did the data take you and how did you turn it into information to help shape your strategies and action plans? A: Data Haven interpreted and compiled the data for us to create countywide and statewide reports, as well as provided us with raw data for Norwalk and surrounding towns. We were able to do some comparative analysis and pull out the key findings to build our action plans around. Some of the key findings included that the primary reasons folks were admitted to the hospital had to do with chronic disease conditions, high blood pressure and diabetes; the top three causes of death in our community are attributed to heart disease, cancer and stroke. Q: Was it this information that led to the launch of the Healthy for Life Project? A: Yes. The Healthy for Life project got underway in 2012 as a result of that year’s Health Assessment. At that time, there were more than 35 organizations with programs underway and their own missions and reason for being. We were trying to look for ways to work together, align our common goals around three or four initiatives that we could work on together, keeping in mind the program’s primary goal which was to take a regional approach to promoting healthy living- to reduce and prevent obesity and chronic disease and make our community a healthier place to live, work, learn and play. Q: How has your involvement with Norwalk ACTS helped you develop specific strategies and activities to improve the overall health of the community? A: Norwalk ACTS provides us with a constant reminder to focus on the outcomes. Norwalk ACTS also gave us the structure to evolve. We started with a Health and Wellness Community Action Network (CAN) task force, and then we realized that health and wellness are part of the entire cradle to career continuum, affecting every child in the city. We started thinking about whole child, whole school, whole community and started to evolve toward affecting policy because we could exhaust ourselves with programs and initiatives, but if we brought about policy change, it would have a broader impact. Q: What have your biggest challenges been in the work you’re doing? A: We’ve definitely experienced some growing pains along the way, trying to get everyone on the same page. But whenever things start going off the rails a bit, we always go back to our outcomes. Outcomes provide clarity to the work. Another thing we are always reminding myself ourselves is that you can have numerous organizations working on health and wellness outcomes, but not everyone will be engaged at the same level, which is okay. Everyone can play a role. If you can keep members engaged and show them how the work is relevant to their organization’s core mission and how to utilize their particular skill set, they may be more engaged down the road. It’s not about getting everyone on the bus… it’s about getting them in the right seat on the bus. Q: Can you speak to that deeper level of engagement and changing mindsets? 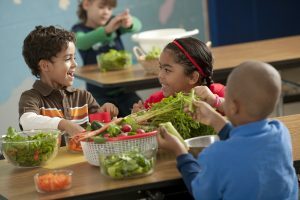 We have not had difficulty getting folks around a table to agree that kids should eat more fruits and vegetables, but when they’re asked to Commit to a Common Agenda, Agree on Shared Measurements and Data Collection, Engage in Continuous Communications, and the other elements of Collective Impact, that’s when it becomes a bit more difficult. It’s like the cartoon that asks, “Who wants change?” Everyone raises their hand. “Who wants to change?” No one raises their hand. The work around a healthy community intuitively makes sense and for the most part, we have gotten people on board by convincing them that working collectively can be a resource and benefit to their organization’s mission as well. Q: Does Collective Impact present any other challenges? A: Initially, Collective Impact is a bit difficult to grasp i People often confuse it with collaboration. And sometimes members of our work groups have an issue explaining why they need to share their company’s data or attend so many meetings. I feel we’ve made a lot of progress, but we have a ways to go before it’s working like a well-oiled machine. Once you can bring the results (data) to people who are interested in change, particularly investors, then you get their attention and have a better chance of getting them on board with the concept. With health and wellness, social/emotional and other areas, some of these outcomes are hard to quantify… we don’t have monthly data checks. In fact, it might take years to show that our community is making progress. Our strategy is prevention health, and we can’t prove what we’ve prevented. Q: Tell us about Campbell’s Healthy Communities, one of the early supporters of Collective Impact work? A: Campbell’s is the parent company of Norwalk-based Pepperidge Farm, which has always been extremely supportive of health initiatives at a local level from both an investment and volunteer standpoint. Now Campbell’s has taken a more active role through Campbell’s Healthy Communities. 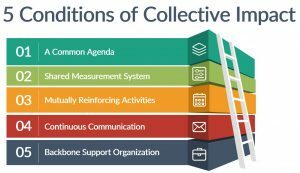 They are fully aware of the Collective Impact model and try to practice it in their hometown communities where they do business. They were very impressed that we were a Collective Impact community and Norwalk ACTS was here to support the work being done. Q: As an investor, how does Campbell’s hope to measure success of Norwalk’s healthy initiatives? A: We know that children spend too much time sitting, but we can’t add more Physical Education or recess time. We are looking at in-class or transition time activity. Short bursts of physical activity can add up. We developed the Move More in School Toolkit and one popular program is an app called GoNoodle, where teachers use the smart board to lead students through a series of activities. These activities can be tied to the curriculum, can promote mindfulness and more. 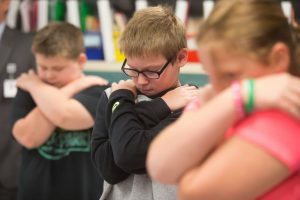 Campbell’s Healthy Communities Initiative funded a GoNoodle pilot program at Cranbury Elementary School last year, which was very successful. The data showed that students were receiving an extra 9-25 minutes of physical activity per day, which is huge! We are hoping to expand to other schools this year. Q: What is your biggest success or accomplishment in the past year? 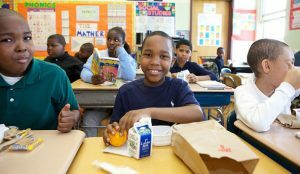 A: By federal regulation, the Healthy Hunger Free Kids Act states that all school districts that receive federal funding for the National School Lunch Program are required to have an up-to-date Wellness Policy and Wellness Committee. Norwalk’s policy was written in 2006 and hadn’t been updated since. So it was an easy sell to get this done. We started from scratch and did a lot of research, looking at other communities that we felt had policies we wanted to model. We also used language from the Connecticut Association Board of Education (CABE). Once we had a draft, we had our consultants from the Center for Healthy Schools in Westchester, PA, take a look and go through their checklist to make sure we met all the criteria. Then we met with leaders from Norwalk Public Schools (NPS) to see if the policy was practical and feasible. We presented it to the Board of Education in June of 2016, and they were very supportive. It was bee-lined through the process and in February 2017, the Wellness Policy was unanimously approved. It’s not often that things get passed unanimously in Norwalk! Q: Now that an updated Wellness Policy is in place, how do you see the health of Norwalk’s children improving? A: After the policy had passed, we met with the Superintendent and school administrators who were anxious to put the policy into effect and provide us with the resources we needed to get going. A consultant was hired to examine school lunch quality and they recommended increasing fresh food and vegetable availability, which dovetailed nicely with our outcomes. We currently have 14 school gardens in place, with the support of GE, Pepperidge Farm, FoodCorps, Whole Foods and others. The garden produce is now being used in the schools for tastings and educational purposes, helping children learn about the food that’s on their plates. This fall, NPS also created a new staff position designed to ensure that food served across the district is delicious, nutritious and visually appealing- thus aligning with the goals of the 2016-2017 NPS Strategic Operating Plan and new school Wellness Policy. The school district also put in place a “Grab ‘n Go” Breakfast Program, piloted last year at Brookside Elementary School. Thanks to a $52,000 grant from the American Association of School Administrators (AASA), NPS is rolling out the program across the school district in three phases. By the end of the 2017-18 school year, all elementary schools and Ponus Ridge and West Rocks Middle Schools will provide students with food to grab in the morning on their way into classroom. Phase three will take place during the 2018-19 school year, launching the program at Brien McMahon High School, Norwalk High School, Nathan Hale and Roton Middle Schools. We are definitely changing mindsets and systems to ensure all students start their day prepared to learn and succeed and to promote the overall health and wellness of our children, inside and outside the classroom.